The focus of this chapter is the prevention, identification, and management of neuropsychiatric symptoms (NPS) in those living with major neurocognitive disorders (MNCD). NPS refers to those behavioral and psychological symptoms that routinely cause suffering for individuals with MNCD, as well those who care for and about them. MNCD, often referred to as dementia, is a cognitive, behavioral, and functional syndrome. 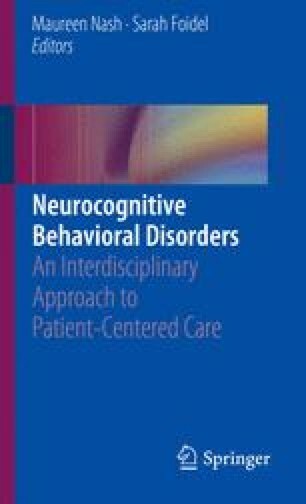 This chapter serves as a pragmatic and compassionate guide for management of NPS that commonly afflict individuals living with MNCD. NPS contribute to suffering and comprise the leading cause of quality of life concerns for those living with MNCD and their families. It is the NPS, rather than the NCD itself, that most often leads to placement of individuals in long-term care facilities. The authors of this text posit that the suffering caused by NPS needs to be the major focus of assessment and treatment. Therefore, this chapter will describe types of MNCD in the context of the various NPS that are associated with common dementias. This chapter describes the predominant MNCDs. Degenerative NCDs include Alzheimer’s dementia (AD), dementia with Lewy bodies (LBD), Parkinson’s-related dementia (PDD), NCD due to Huntington’s disease, and frontotemporal lobe dementia (FTLD). Injury-related NCDs include vascular dementia and NCD due to traumatic brain injury (TBI). This chapter will end with a discussion on delirium, a potentially reversible NCD that is a result of toxic or noxious stimuli. The discussion of these NCDs will include diagnostic criteria, etiology, and treatment considerations, with emphasis on NPSs that accompany each NCD. American Psychiatric Associations‘ Practice guideline on the use of antipsychotics to treat agitation or psychosis in patients with dementia. 2016. https://doi.org/10.1176/APPI.BOOKS.9780890426807. Center for Medicare and Medicaid Services. Yearly “Wellness” visits. 2018. Retrieved from https://www.medicare.gov/coverage/yearly-wellness-visits. Ho SL, Chorea. The International parkinson and movement disorder society; 2018. Retrieved from https://www.movementdisorders.org/MDS/About/Movement-Disorder-Overviews/Chorea%2D%2DHuntingtons- Disease.htm. Paulsen JS. The cognitive disorder. In: Nance M, Paulsen JS, Rosenblatt A, Wheelock V, editors. A Physician’s guide to the management of Huntington’s disease. 3rd ed. New York: Huntington’s Disease Society of America; 2011. p. 51. Retrieved from http://hdsa.org/wp-content/uploads/2015/03/PhysiciansGuide_3rd-Edition.pdf. Rose, SS. Geropsych pearls; 2018b. Retrieved from www.geroconsult.org.